Reasons for executive sessions under KOMA need clarity | Kautsch Law, L.L.C. The law provides some guidance for the second and third requirement. The subjects that may be discussed are limited to the list set forth in K.S.A. 75-4319(b)(1) through (16), and the Attorney General’s Office has done a nice job collecting the relevant cases and Attorney General Opinions that clarify the statutory language on pages 12 through 15 of that office’s KOMA outline. Further, the statute’s requirement that the body announce the “time and place at which the open meeting shall resume” is self-explanatory. In light of the statutory language and the manner in which it has been interpreted in State v. Board, this motion is sufficient to permit the body to enter executive session. It lists a subject from the statute, specifically student discipline, which is included at K.S.A.75-4319(b)(5). It cites “privacy” as a justification. And it lists the time and place the body will reconvene. Thus, it appears that executive bodies are likely compliant with K.S.A. 75-4319 as long as they cite privacy as a justification for entering an executive session. 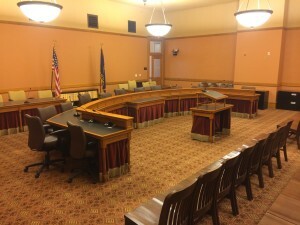 Given the desire to recess to executive session is often driven by a desire to keep information confidential, the justification requirement doesn’t appear to have much substance. In recognition of this flaw, the Senate Judiciary Committee introduced a bill during the 2016 session seeking to make the justification requirement more than pro forma. The bill would have required greater specificity about the subject to be discussed, and would have re-branded the “subjects” currently listed in K.S.A. 75-4319(b) as “justifications.” Although the bill died in committee, the fact remains that as long as executive bodies need not supply any substantial justification for recessing to executive session beyond “privacy,” the effectiveness or necessity of KOMA’s justification requirement is debatable. Texas open meetings law goes even further by devoting a specific provision to each purpose to recess to an to executive session, rather than simply place all the purposes in the same section, as in Kansas and Oklahoma. Although that method appears to be a bit clunky, it highlights the policy that executive sessions should be rare, and are only allowable under very specific statutory terms. To improve KOMA, my proposed solution incorporates the more specific language found in the open meetings laws of Oklahoma and particularly Texas into the “subjects” that may be discussed in executive session. I have also deleted any reference to the confusing, and ultimately unnecessary, requirement for a justification. K.S.A. 2016 Supp. 75-4319 would be hereby amended to read as follows: (a) Upon formal motion made, seconded and carried, all public bodies and agencies subject to the open meetings act may recess, but not adjourn, open meetings for closed or executive meetings. Any motion to recess for a closed or executive meeting shall include a statement of: (1) The justification for closing the meeting; (2) the subjects to be discussed during the closed or executive meeting; and (3)(2) the time and place at which the open meeting shall resume. Such motion, including the required statement, shall be recorded in the minutes of the meeting and shall be maintained as a part of the permanent records of the public body or agency. Discussion during the closed or executive meeting shall be limited to those subjects stated in the motion. (16)(15) matters permitted to be discussed in a closed or executive meeting pursuant to K.S.A. 2015 Supp. 46-3801, and amendments thereto. (c) No binding action shall be taken during closed or executive recesses, and such recesses shall not be used as a subterfuge to defeat the purposes of this act. (d) (1) Any confidential records or information relating to security measures provided or received under the provisions of subsection (b)(13), shall not be subject to subpoena, discovery or other demand in any administrative, criminal or civil action. (2) (A) Except as otherwise provided by law, any confidential documents, records or reports relating to the prisoner review board provided or received under the provisions of subsection (b)(16) shall not be subject to subpoena, discovery or other demand in any administrative, criminal or civil action. (B) Notwithstanding any other provision of law to the contrary, any summary statement provided or received under the provisions of subsection (b)(16) shall not be subject to subpoena, discovery or other demand in any administrative, criminal or civil action.